The weekly women's ride last night was great, as always. The hubby and I lifted weights Tuesday night, and my quads were still sore from that. Our 27-mile route was super hilly, so my poor legs burned the entire ride! I pushed it, too...no letting up. It was so good to get back out on the bike! After the ride, S.J. served chips and beer out of the tailgate of her purple mini-van. I had an Oberon. It was a nice reward for my hard work! The ladies couldn't believe that I'm 29 years old. I get that all the time. One of them made me show her my driver's license. At least they were being sure not to serve alcohol to a minor, right?! 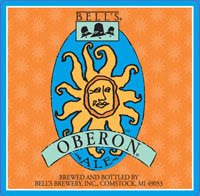 mmmm oberon. i miss bell's. i wish i could get it out here in portland. ah well, i'll be sure to drink my fill when we're in traverse city in july!